If you’re a Boomer, you may find you’re losing your balance or fearfully skipping some things that used to be fun. The good news is you can get your balance back. This series of practices starts very simply in a chair. You will be challenging your attention, your strength and your flexibility in a very safe way that will improve your balance over time. Spend extra time on sessions that are challenging. Return to easier ones when you are tired. Show up consistently and your balance will show up for you. Your better balance will have you showing up for more joy in your life! This first session keeps it really simple. You may be surprised by how much strength you can build sitting in a chair and how much that will improve your balance. You will start to feel the sensations of your breath and how linking breath to movement will create a sense of awareness and calmness that help you truly live in your body and help you feel where you are in space. Enjoy the simplicity of moving your spine and strengthening your hips and core. And practice getting in and out of a chair with grace and ease. We stay in the chair and add more challenging movements that will add more strength to your lower and upper body. And all of it will also strengthen your core! We play with moving mindfully and also holding steady to the center. This builds awareness that will help you balance better when we get up to stand. Notice that as movements become more familiar, linking breath and movement starts to feel easier. And how as you continue to practice, you will feel more fluid and graceful. Let's get up and get our standing balance in gear! We will review some of the seated movements with extra attention to the feet as our base of support for better balance. Then we move to the wall to do some standing one-legged balance. It may look simple but it's definitely not easy! It's a good time to remember that it's a practice and that you will get stronger and more balanced with practice over time. Celebrate your success in sticking with your practice! Are you ready to play? 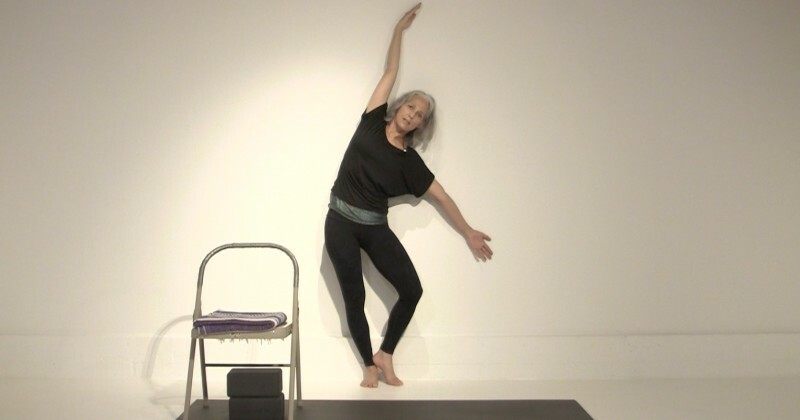 Let's shift into and out of the chair with some new standing balance poses at the wall. Using the wall to keep us steady and give us feedback, we will play with tree variations that explore shifting our balance side to side. This creates confidence that we can get a little off balance and catch ourselves with our strength, flexibility and awareness. We return to the chair and continue this play of the push and pull of finding balance points and returning to center. Be sure to notice that each pose and each day gives us new insights and opportunities to feel balance. We take a big step with balance in this session. We begin in the chair and go to the wall for tree. Notice how much you use the wall and maybe challenge yourself by giving some space between you and the wall. Then we use the wall for a Warrior 2, stepping the feet wide apart to build strength in a wider range of motion. Be curious about using the chair for the warrior pose, especially when you feel ready to take a bigger/wider step. This builds strength, flexibility and best of all confidence! In this last session, we use the chair for support and strength in chair pose and warrior 1. Notice how squeezing into the chair with your hands connects you to your center and helps you stay steady. And how it builds more strength so that you get a sense of your whole body feeling stronger, steadier and more balanced. As you build confidence, consider stepping into and out of the warrior pose without using the chair. And you may feel ready to move on to the chair vinyasa course. It's a more challenging course with more sessions that use the chair for bigger movements and more variations. Celebrate yourself for taking time to create more balance in your body and more joy in your life!